The Fitbit Force activity tracker is supposed to keep you healthier, but for a some wearers the wrist-mounted device is actually causing an unfortunate skin irritation. That's why the company is issuing a voluntary recall for its four-month-old health technology and all Fitbit Force product is being pulled from store shelves. "While only 1.7% of Force users have reported any type of skin irritation, we care about every one of our customers," said Fitbit co-founder and CEO James Park in an open letter. "We have stopped selling Force and have decided to conduct a voluntary recall. We are offering a refund directly to consumers for full retail price." That means Fitbit Force owners will be able to send in their activity tracker and receive a check for $140 (about £84, AU$156) to cover its full retail price and all taxes. No receipt is needed. The deal doesn't apply to Fitbit Flex or any other devices from the San Francisco startup. New Fitbit Force 2014 on the way? Fitbit has been investigating the cause of the Fitbit Force skin irritation problem and concluded that some users may be reacting its to the nickel present in the surgical grade stainless steel. Others are "likely experiencing an allergic reaction to the materials used in the strap or the adhesives used to assemble the product," said Park. 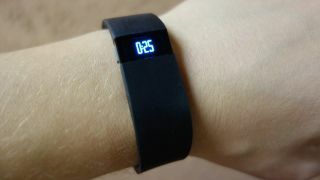 He promised that Fitbit is working on its next-generation tracker that will be announced "soon." Whether that's a hypoallergenic Fitbit Force or a whole new Fitbit with call notifications features that never came to pass hasn't been shared just yet. It'll have to compete with existing rivals the Nike FuelBand SE and Jawbone Up as well as forthcoming fitness bands and smartwatches like the Razer Nabu, Garmin Vivofit and, of course, the rumored iWatch. Expect an S-Health-equipped Samsung Galaxy Gear 2 next week.